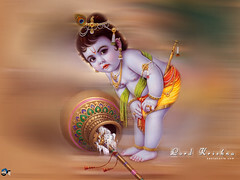 Hello everyone, Wish you all Happy Dusshera. Hope everyone enjoy the festive session with fun and joy. So how you guys are celebrating the festivals? I'm kinda busy now a days so not able to blog much :-(. But never mind I'm back with simple recipes of Puffed Rice Upma and some fruity jelly. These are simple and fast recipes to prepare and taste yummy. 1. In a pan heat oil, add mustard seeds and allow it to splutters. 2. Add dry red chilli, half portion of chopped onion, chopped green chilli, peanuts and saute until onion turns light golden brown. 3. Meanwhile soak the puffed rice in water for a min and squeeze well to remove all the water, keep them aside. 4. Add curry leaves, turmeric in the onion and mix well, cook for a min. 6. Cook for a min & off the flame, sprinkle the chopped coriander leaves, other half of the onion and mix again. Puffed rice upma is ready. 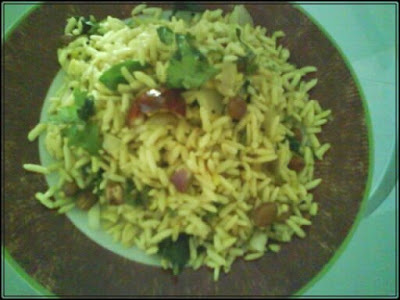 This takes less than 10mins, onions and peanuts gives crunchy taste to it. It's very good for breakfast or snacks or exclude the onion to make it Prasad for pooja. 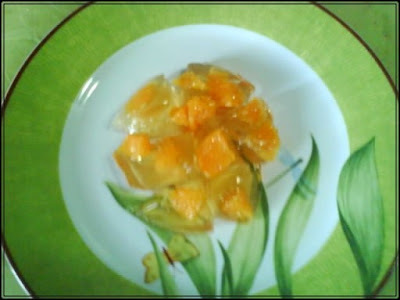 Now coming over to the jelly, this one was made for Kedar since he likes jelly very much. 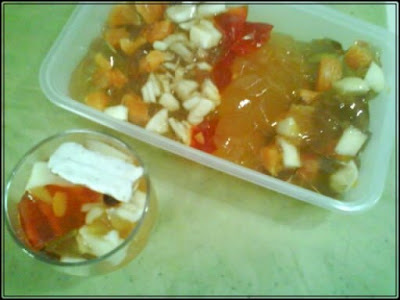 I just added few fruits to make the jelly more interesting. I used one packet of jelly mix and follow the instructions in the pack ie boil water and mix the jelly powder and boil it for 5-7 mins. Meanwhile chopped the fruits of your choice. I used 1 green and 1 red apple, 1 orange, 1/2 cup mango puree, few almonds and raisins and some food colour. Pour the jelly liquid in separate blows depending on how many types you want. 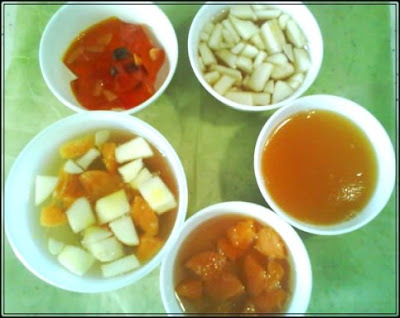 In the first one added orange pieces, next chopped apple, next was to mix apple and orange in one bowl. In another I added 1tps of food colour along with almonds and raisins. In the last bowl added 1/2 cup mango puree and 1/4 cup jelly liquid. Let all the liquid to set. And Serve with more chopped fruits, ice cream or just like that. 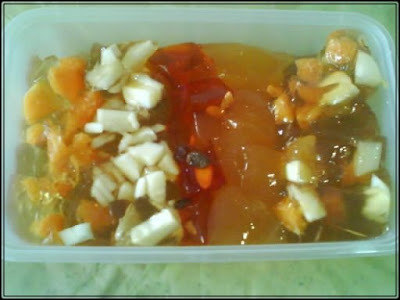 jelly fruits salad looks yumm..happy dasshera.. I love jellies, lovely they r..with fruits they look awesome Priti...Happy DUsshera too priti..no words to say about puffed rice, mouthwatering.. I have puffed rice a plenty with me,I shall try :) Dessert looks yummy!! Thanks Rekha, Sowmya, Priya & Shreya for your lovely comments. happy dussera priti...............what a coincidence i prepared this upma 2day with slight changes......had with kara vada and sundal. Happy Dusshera to You and your family Priti!!! Happy Dusshera to you and ur family priti..
jellys are very much liked by my daughter.jellys looks colourful..
Jelly fruits salad looks yumm &awesome Priti.. Happy Dusshera to you and ur family priti. I've read so much about this puffed rice upma but haven't tried before. Looks yummy and the jelly fruit salad is great too. Nice entries shreya. The jelly is looking awesome. And btw, I added the email id to the post. Please check and send in your entry for sunday snacks. Happy Dusshera to you and your family! Fruit jelly is simply awesome :) Upma sounds quick and easy! Happy Dusshera! Happy Dusshera to u too Priti, and yes puffed upma is really yumm, greattt entry!!! lovely upma Priti! I posted a recipe for the same long back. YOurs look more delcious. Happy Dasara! Upma and Jelly look very festive. This is a very nice recipe. Uppma looks so good. Puffed rice Upma is simply awesome. Fast to cook and sounds yummy. Must try this soon. Jelly looks awesome and simple. wow Priti....Jelly looks mouth watering delicious. Upma is really a comfort food that i love to make. I'm going to try jelly soon. Happy Navratri to you and family, dear. Yummy entries, especially the poha upma.